The 701 is the last steam locomotive to make its regular run on the Ontario Northland Rails prior the introduction of diesel use in this area. Built at Kingston in 1921, this engine retired from service in July 1957. 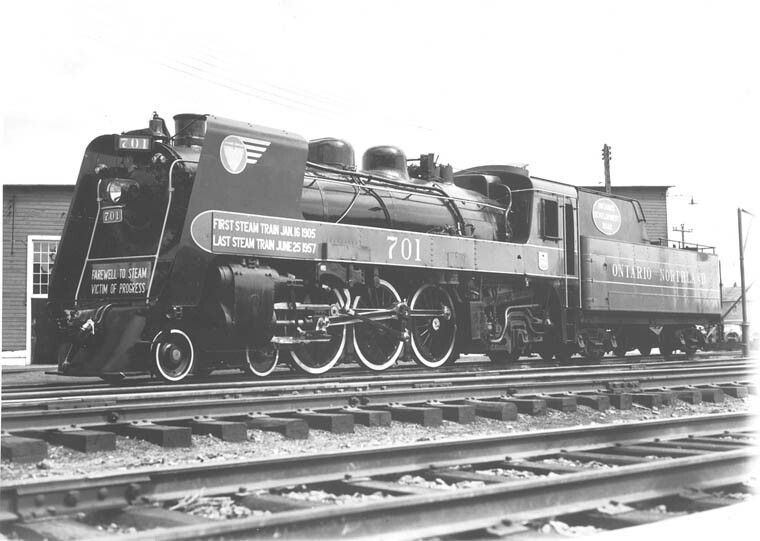 Of the Pacific type 4-6-2 with a total of 70', this 125 ton iron horse pulled a tender of 77 tons which carried approximately 12 tons of soft coal and 6500 gallons of water. The massive engine has a tractive power of 36, 600 lbs and plied the rails of Ontario Northland with dignity and power. Many fondly recall the days of the 701 with all of its pride and youthful glory. The engine, anchored beside the ONR Station, serves as a historical monument for the town. Steve " Mr. Steam" Bratina of Cambridge in collaboration with former rail roaders worked to restore the engine's cab. Over 400 hours surplus have been invested into restoration and maintenance. A photo with the 701 would add exclusive experiences to complete any trip. You as a child, standing by the Ontario Northland (Temiskaming & Northern Ontario) railway track waving at the engine going by. Remember the thrill you felt as that smile stretched ear to ear when you heard that whistle blow. 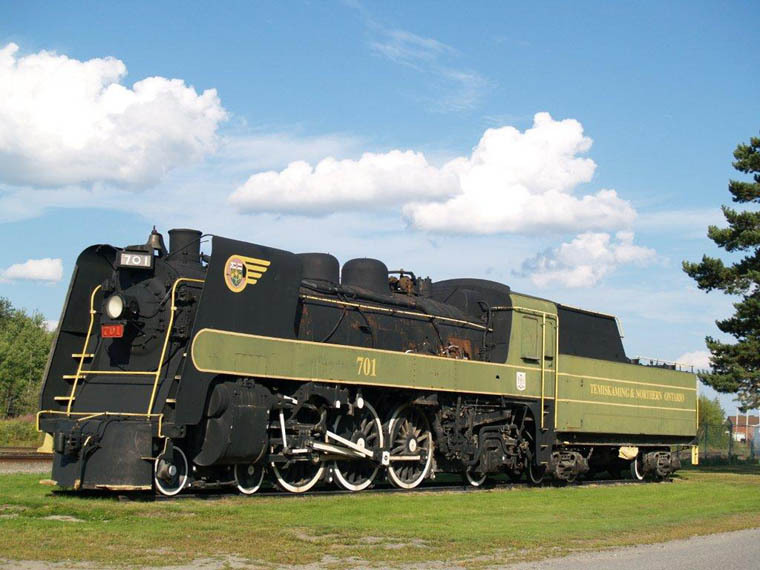 Help is needed to protect the recently refurbished 701 Steam Locomotive from the elements. This Iron Horse requires a protective canopy to continue looking healthy for generations to come. Please visit the 701 Restoration Committee on facebook or contact Liz Robitaille (705-544-2051, lizbythelake@live.ca) for more information on the canopy project and how your contribution will preserve this historic legacy. The “701” Restoration Committee appreciates your support. More on the 701 (throughout various restoration phases) can be viewed through the following links.